Part of the fun of joining in of the Little Bit French SAL was to join in a gift swap. On Friday afternoon, my poor postman knocked on the door. He looked half drowned, and was very apologetic about the parcels disintegrating in his hands. Happily, the contents were all intact, and I opened a parcel from Fiona of BubzRugz. She had wrapped the items in a tea towel from Australia, probably the only thing to hint of sun we shall see this month! What made this even more exciting, I have been reading Fiona's blog for some time, so it was a lovely surprise to receive from someone I "knew", even if she didn't know it. I shall look forward to using everything, and getting to know Fiona better over the coming months. Your tea towel is the only hint of sunshine down under too, Jane! Well in Melbourne anyway. It is FREEZING here at the moment, although I guess to a British person, our version of cold is probably more like Autumn! 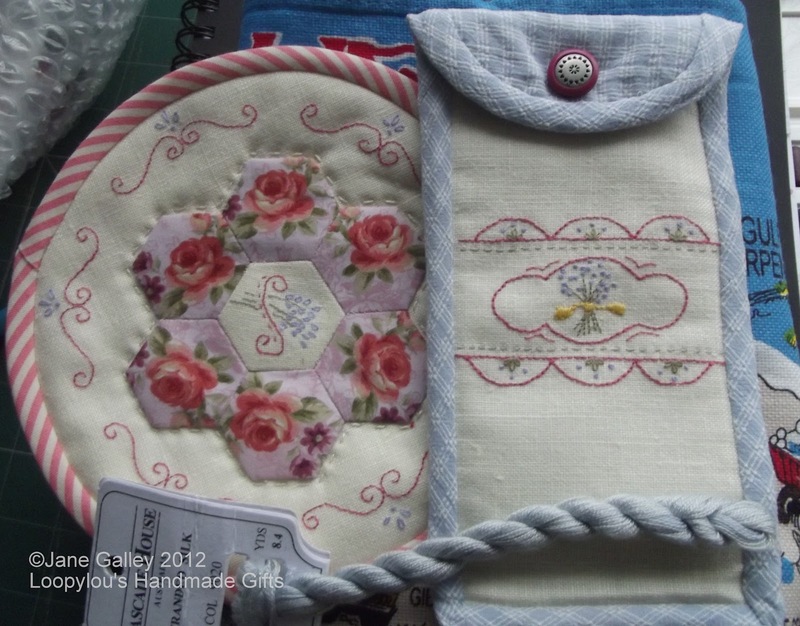 That is a lovely swap parcel you've received from Fiona; I have visited her blog sometimes and admired her work. Lucky you! Not so lucky postman. I hope your weather clears in time for the games. these are gorgeous...well worth a soaking for the postman! Lucky you Jane, these are so lovely. The secret part of this swap has been oddly really fun.